Mighty rivers drain north and east from the Rocky Mountains into the watershed of the Arctic Ocean. Look at any map of Alberta and you will see them: The Athabasca, Smoky, Peace, Chinchaga and Hay, tracing sinuous patterns across the vast northern half of the province, a lightly populated and little-known region of dark forests and muskegs. This is the Boreal Forest Region which comprises 48 percent of Alberta. Geologically, this landscape is very similar to the better-nown prairies of the south. Vast continental glaciers scoured northern Alberta and then retreated, leaving a rolling landscape covereed with glacial till, carved by huge rivers and occasionally interrupted with low hills. But this far north, there is more rain, less summer heat and longer winters, so the landscape is heavily forested and covered with vast bogs and muskeg. Most southerners think of mosquitoes, moose and muskey when they look at an map of Alberta north of Edmonton. In reality, there is a great diversity of vegetation and wildlife in the boreal forests, from the complex wetland meanders of the Hay River to the lush mixed forests of aspen, pine and spruce in the Lakeland area, to the complex vegetation mosaics of the Clearwater, Peace and Athabasca river valleys. Northern species like the arctic grayling, river otter and black-throated green warbler rely on the boreal ecosystem and remain elsewhere in the province. Endangered species such as the well-known whooping crane and the woodland caribou also depend on the boreal forests for their well-being. The boreal forest has remained wilderness for much of this century, but recently it has undergone rapid resource development. Recent forest management agreements have set the stage for roads and clearcuts over the entire area, feeding new pulp mills on the north's major rivers. Oil and gas exploration and development has left a legacy of linear scars throughout the northern boreal region. Thus, the need to protect places in the boreal forest like the Caribou Mountains, the Clearwater River valley, Buffalohead Hills, Wabasca River and Lakeland is urgent as the eyes of the resource hungry south turn more and more to the north. 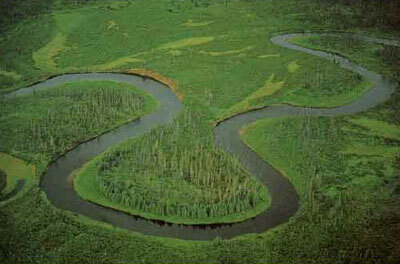 However, the Alberta Government is lagging in protecting portions of the boreal landscape. For details, read this Edmonton Journal Special Report on Special Places 2000.